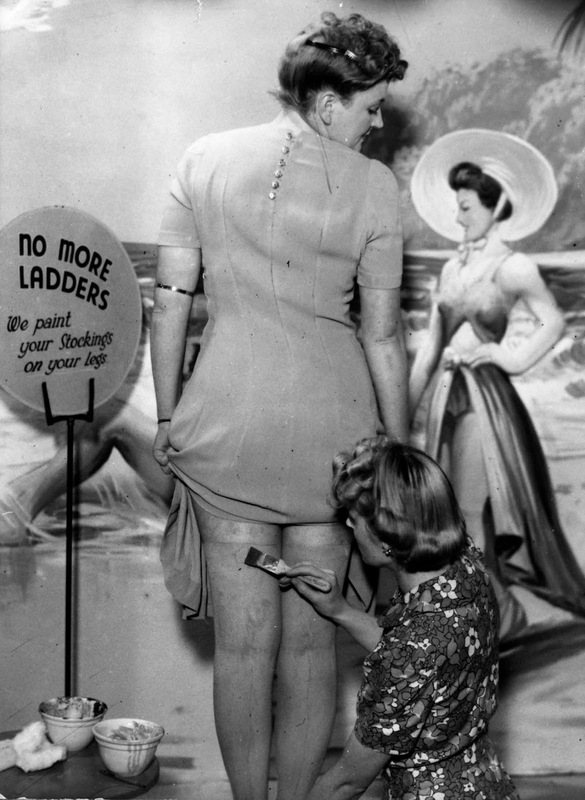 A woman painting the appearance of silk stockings onto another woman’s legs. Very little silk was available during WWII in the U.S.
Until the end of the 1930s the best women’s stockings were made from silk. This changed in the United States when DuPont began manufacturing nylon in 1939. Nylon stockings went on limited sale in October of that year followed by a national launch at selected stores in 1940. Eager American shoppers bought up the new nylons even though they were priced the same as those made of silk. DuPont struggled to keep up with demand and American women were still complaining of shortages in 1942 when the United States joined the war. Commercial quantities of nylon stockings would not reach the rest of the world until after 1945. Although most nylon was used to make stockings, some was bought by the American military to replace silk in the manufacture of parachutes. When the United States entered the war, DuPont shifted nylon production to a war footing and production was channeled into national defense uses, including parachutes and bomber tyres, and supplies of nylon for stockings dried up. A new fashion arose from the nylon ration. Liquid stockings, it was called. A foundation for your legs, applied carefully and evenly for the illusion of hose. Advanced users got even more realistic by using black eyeliner pencils to draw the “seam.” Drawing in the seam-line on “Makeup” stockings with a device made from a screw driver handle, bicycle leg clip, and an eyebrow pencil. 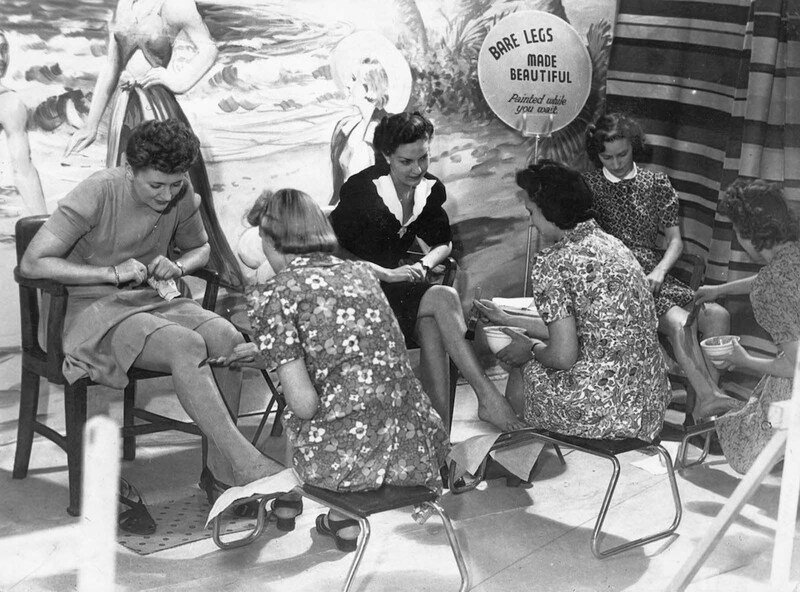 In an attempt to drum up sales, some stores ran promotions where you could have your legs painted to see the effect or had specialist leg make-up bars where you could purchase the cosmetic and get advice on how to apply them for best effect. Helena Rubinstein was an early American advocate of the leg bar. In 1942 she opened a Bare-Leg Bar in her 5th Avenue salon. The bar featured leg make-up, special lotions, creams and cosmetics for the legs, a cooling masque for legs and feet, foot talcs and pedicure preparations. 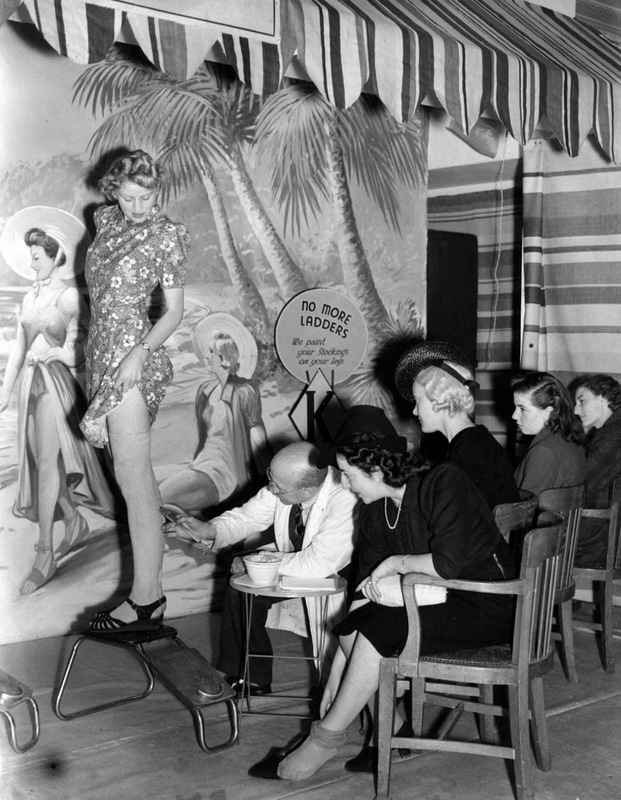 On the opening day different types of cosmetic stockings were demonstrated – stick form, out of a bottle, and sprayed on the legs. The end of the war saw nylon stockings return to the shelves and the decline of substitutes. DuPont began producing nylon for stockings less than two-weeks after the Japanese surrendered. The resumption of limited sales of nylons in the United States produced what reporters of the time called the nylon riots of 1945 and 1946, as women scrambled to buy them. In those parts of the world which were economically depressed and/or clothes continued to be rationed, cosmetic stockings lingered longer and were still being sold in the 1950s, well after the war was over. The eventual disappearance of cosmetic stockings was not the end of leg make-up, it was still used by some to make the legs looked tanned. Drawing a straight even line down the back of the leg was the most difficult part. 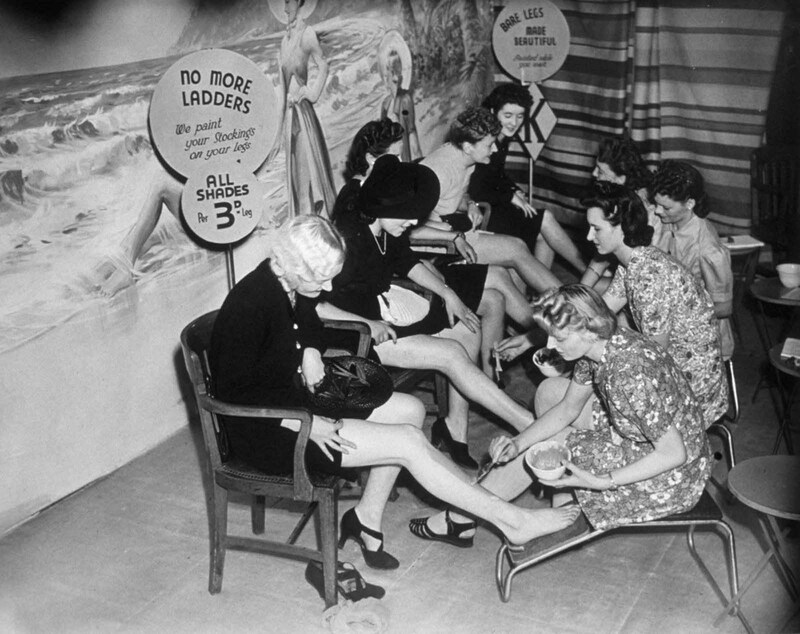 A shoe store offers a unique service by painting stockings on women’s legs during the clothing rationing of World War II. A representative of Max Factor paints cream stockings onto a woman’s leg as a solution to the unavailability of stockings during the war. 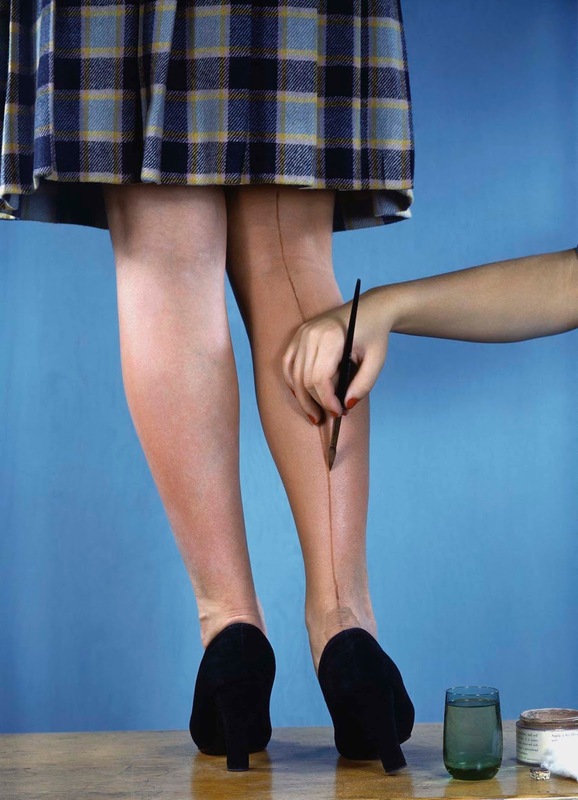 A Max Factor beautician paints a seam on a woman’s leg to help create the illusion of stockings. During stocking rationing, a beautician at the newly opened Bare Leg Beauty Bar at Kennard’s store in Croydon, England, paints stockings onto a customer’s skin.